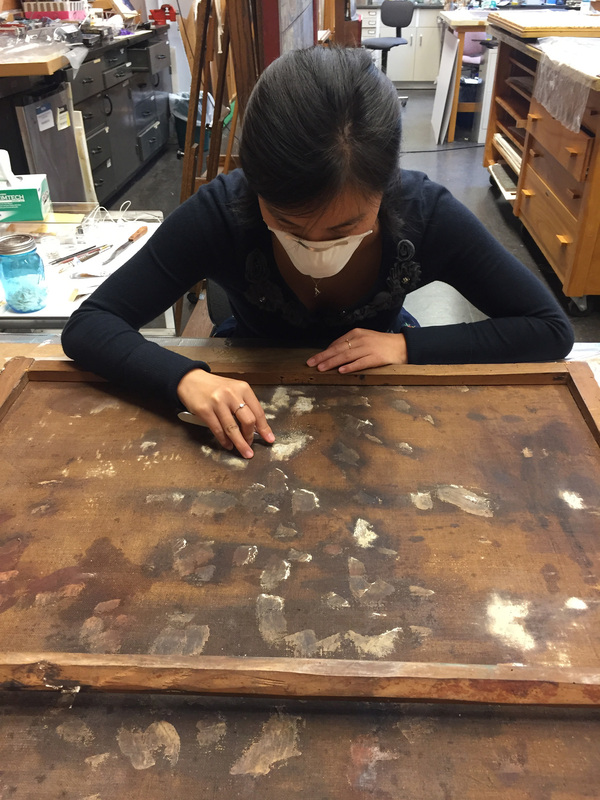 As a fellow in painting conservation in the Winterthur/University of Delaware Program in Art Conservation, I am lucky enough to work on some fascinating projects that allow me the opportunity to collaborate with conservators at other institutions, doing a little detective work. The painting I treated in the fall is a great example of this. It depicts Christ as the Man of Sorrows. 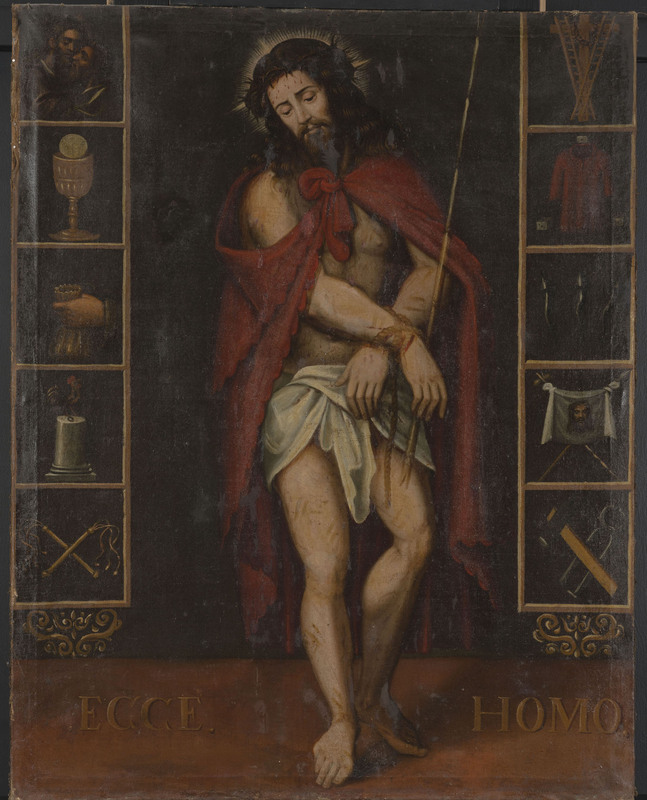 It’s painted in the style of a 17th-century Spanish or Spanish Colonial painting and would likely have hung in a church where it would have served as an instrument to connect the faithful with Christ’s suffering. Ten stations of the cross are depicted in the boxes flanking both sides of Christ. The painting was originally purchased in Madrid, Spain, during the Spanish Civil War—a time when religious works of art were systematically destroyed. 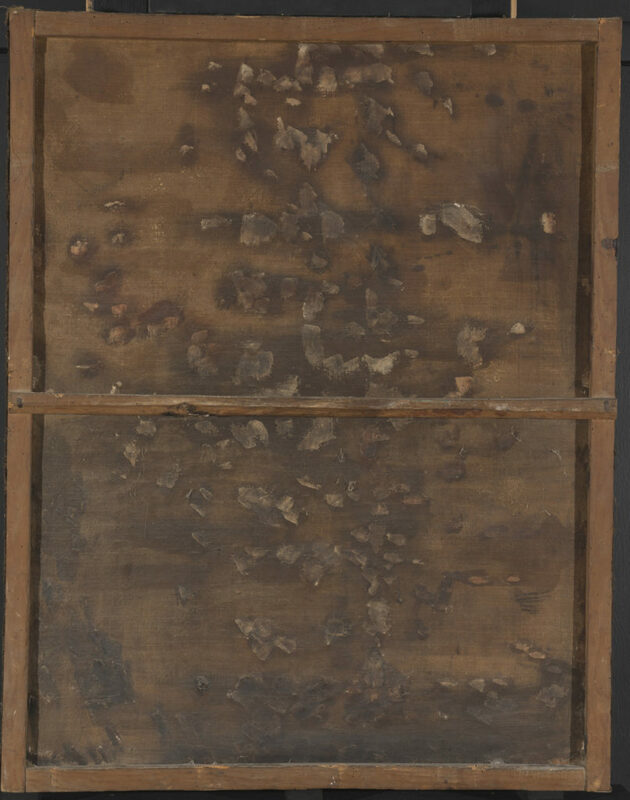 When the painting arrived at Winterthur, the backside was covered in thick, white paste splotches that had been painted over with dark brown and red colors. The owner hypothesized that this was evidence that the painting may have survived shrapnel attack from the Spanish Civil War. Indeed some of the paste was applied in areas that corresponded to a tear in the canvas or areas of paint loss in the front, but most were applied in areas with no structural damage. Regardless of the reasons for applying the white splotches on the back, it was critical for the treatment of this painting that these splotches be removed to return the backside to a smooth surface finish. Since the paste was not present for purely structural reasons, we reached out to the wider conservation community via Facebook to determine if anyone had seen paste splotches like this before. This was done in an effort to ensure that there was not cultural or historical significance attached to these splotches that should deter us from removing them. We heard from colleagues as far as Spain and Peru about traditional pastes used as adhesives, but in the end, all feedback suggested the paste on this particular painting was safe to remove. Additionally, scientific analysis of the paste suggested the binder was not consistent with the historic materials suggested by our international colleagues. I have now successfully removed all areas of the paste on the surface by carefully scraping the paste off with a scalpel. 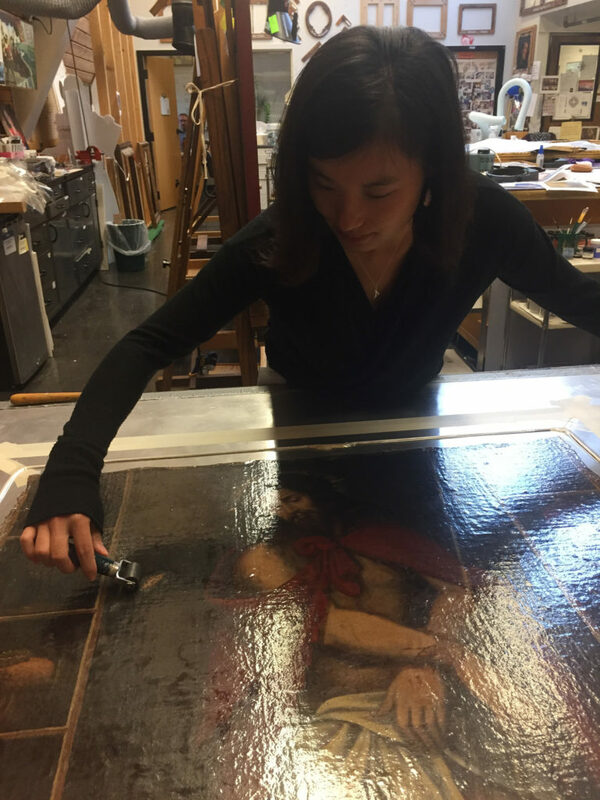 With the back surface now smooth, we were able to humidify the painting and subsequently apply vacuum suction under heat to fully flatten and consolidate the painting without fear of having protrusions/areas that stood out from the back, causing bumps in the front. The painting is now ready to be cleaned and stretched onto a new custom made stretcher. 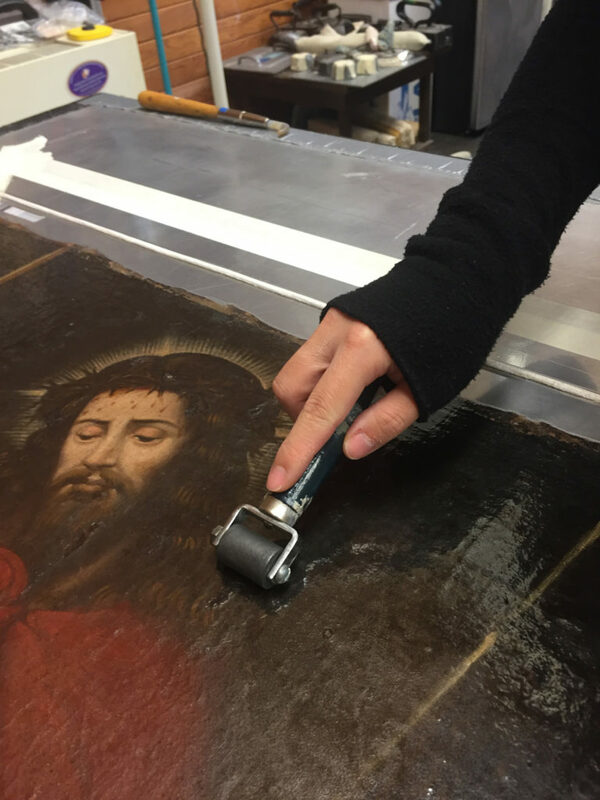 This entry was posted in Academic Programs, art collections, Art Conservation, Paintings, Uncategorized and tagged art conservation, Christ, painting conservation, Winterthur/University of Delaware Program in Art Conservation. Bookmark the permalink. Excellent program and a fascinating post!